Enjoy hiking in the awe-inspiring Rocky Mountains through some of the most beautiful landscapes on earth. Visit spectacular national parks to discover unspoilt wilderness and views of jagged mountain peaks, glaciers and waterfalls. Arrive Calgary and check-in at hotel. Home to the world renowned Calgary Stampede, this most dynamic of cities is a rich fusion of modern architecture and traditional heritage, where the pioneering history of the Canadian west is woven into everyday life. You may have some free time today to explore the city and soak up the friendly ambience of this spectacularly located community. Filled with museums, shops and cafes, the centre of the city is a great place to just wander and take in its majestic setting against the backdrop of those ever present mountains. To the west of Calgary lie the stunning landscapes of Kananaskis Country, Alberta's breathtaking mountain playground. Driving out of the city we head along the Trans-Canada Highway (Highway 1) towards the Peter Lougheed Provincial Park. This landscape is home to bears, elk, moose and mountain lion and we plan to hike out along the Kananaskis Lookout Trail later this morning that takes us through the forest and up to a fire lookout point that offers us some spectacular panoramas across the park. Today's 12 kilometre walk is expected to take around four hours with 420 metres of ascent. Today we continue our exploration of the mountain landscapes of the beautiful Kananaskis Valley, making our way through the forests and willow flats of the Burstall Pass Trail. The trail climbs steeply, heading towards a patchwork of alpine meadows and the Burstall Pass, and up to a viewpoint that, on a clear day, offers views out towards Mount Sir Donald to the south, Mount Birdwood to the north and the peaks of Mount Galatea, The Fortress and Mount Chester. There is also an option today to take a scenic helicopter flight across this spectacular vista. Today's 15 kilometre walk is expected to take around five-and-a-half hours with 475 metres of ascent. We continue hiking in the Banff region today with a route that takes us on the Cory and Edith passes. An often overlooked gem in the area, just 5 minutes from Banff's town centre, this route offers heart pounding ascents (around 900m gain), well worn swtich backs, dense forest and stunning alpine views. This loop trail take us up to the Cory Pass - considered by many to be the most spectacular hike along the Bow Valley Parkway - around Mt Edith and past Mt Louis; easily noted by the towering grey slabs of limestone that form its east face; before returning back to the trailhead on the Edith Pass. Today's 13 kilometre walk is expected to take around six-and-a-half hours with 915 metres of ascent. Our next destination is Kootenay National Park, one of four protected reserves that form the Canadian Rocky Mountain Parks. On arrival we take a hike along the scenic Stanley Glacier Trail, a moderate trail that follows a series of switchbacks through a huge burn area that is covered in wildflowers and lodgepole pine, before crossing the creek and meandering our way towards the open expanse of the Stanley basin. After the obvious evidence of fire presented to us on the lower part of the trail, this later section offers us the contrasting views of the Stanley Glacier and its meltwater run-offs. After our hike we make our way to our campsite for a two-night stay. Today's nine kilometre walk is expected to take around three hours with 395 metres of ascent. Continuing our exploration of Kootenay National Park this morning, we begin our hike on the Kindersley Pass Trail, heading up towards the Kindersley-Sinclair summit, where we join the Sinclair Creek Trail. In total we will be walking for some 16 kilometres today, gaining over 1055 metres during our 6-7 hour hike. Passing through forests of Douglas fir, the trail is dappled with wild roses, blue clematis and yellow columbine, and as we reach the 2395 metre Kindersley-Sinclair Pass we will hopefully be rewarded with some spectacular views of Mounts Sinclair and Kindersley, as well as the Devil's Tooth. Later we have the option to pay a visit to the Radium Hot Spring, Canada's largest hot springs pool. Today's 16 kilometre walk is expected to take around six-and-a-half hours with 1,055 metres of ascent. This morning we drive to Golden where we have an opportunity to pay a visit to the remarkable Kicking Horse Grizzly Bear Refuge (optional). Set up in 2003 this important centre for conservation and research is the largest protected grizzly bear refuge on earth and affords a unique opportunity to witness a grizzly interacting much as it would in the wild. A scenic gondola ride takes us up to the Interpretative Centre, where we can learn more about the life of these magnificent bears from one of the centre's resident naturalists. Another option for today is to take a rafting trip down the Kicking Horse River. From here we continue on to Lake Louise, home to one of the most photographed glacial lakes in Canada. On arrival we will take a walk around this beautiful body of water, perhaps with time to stop for a drink at the historic and imposing Chateau Lake Louise. From our base in Lake Louise we drive out today to Yoho National Park on the British Columbia/Alberta border. The park is home to a seemingly endless spectacle of thundering waterfalls, glacial lakes, snow-capped mountain peaks and deep silent forests, presenting us with some of the most dramatic landscapes anywhere in the country. So inspired were the local tribes by the beauty of this country that they christened the area 'Yoho', meaning 'awe and wonder'. On our walk today we will get to see much of this wonderful landscape when we head out along the Iceline Trail, a dramatic, alpine track that traverses a landscape of rock and ice up to the spectacular Takakkaw Falls. Taken from the Cree word for 'magnificent', the falls are fed by the Daly Glacier and, at 309 metres are the second highest falls in Canada. Today's 13 kilometre trek on the Iceland Trail is expected to take around six-and-a-half hours with 695 metres of ascent, it is considered by many to be one of the most spectacular hikes in the Rockies and is graded as moderate to challenging. This is the shortest version of the hike with other options to include the full circuit via Little Yoho (20.8 kilometres) or via Celeste lake (17.5 kilometres). The Explore leader will present all the options and choose which would be the best depending on the fitness level of the group as well as the weather conditions. This morning we'll drive along the celebrated Icefields Parkway, a breathtaking spectacle of lush coniferous forests, immense mountains, turquoise lakes and humbling glaciers. Our journey takes us into the landscapes of Jasper National Park and up to the Columbia Icefield, site of the most accessible glacier in North America. From here we will hike up to Wilcox Pass, a glacier scoured trail that during the brief summer season is blanketed in wild flowers and anemones. The trial offers some outstanding views of the Columbia Icefields. There will even be an opportunity today to take an optional ice walk on the glacier. Today's eight kilometre walk is expected to take around three hours with 355 metres of ascent. 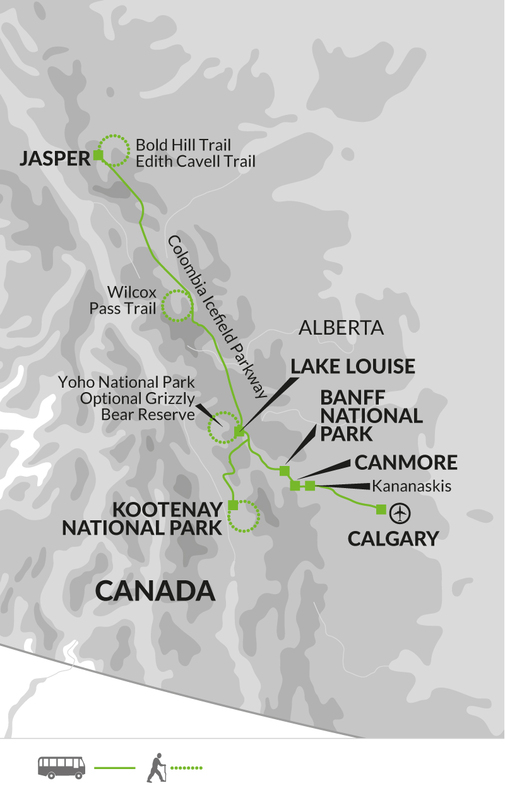 We continue our exploration of Jasper National Park today as we head out to hike the Bald Hills trail. The start of the trailhead is situated at Maligne Lake and, once on the trail, you will be offered some of the finest views of the lake in the region as well as the glaciated peaks to the east. The trail meandres through a protected caribou range and is around 12km round trip, with just under 500m of height gain. Today's 10.5 kilometre walk is expected to take around four-and-a-half hours with 480 metres of ascent. Our last hike in Jasper National Park today takes us onto the Edith Cavell Trail. Mount Edith Cavell was named in 1916 after an English nurse who was executed by the Germans in World War I for having helped allied soldiers escape from occupied Belgium. The mountain is easily viewed after a short way into our hike we reach Cavell Meadows. Also viewed from this area is the Angel Glacier which flows down the north face of Mt Edith cavell and is named as such due to its appearance of an angel with outswept wings. Named in the 19th century when it was much larger, the glacier is slowly melting and will soon no longer have its distinctive appearance. Today's six kilometre walk is expected to take around three hours with 400 metres of ascent. We transfer this morning to Banff along the last of the Icefield Parkway. Set in the heart of the Canadian Rockies and site of the country's oldest national park, Banff is an expansive wilderness of some 6641 square kilometres, encompassing a stunning landscape of spectacular mountain vistas, alpine meadows and crystal lakes. One of the country's most spectacular wilderness areas, it is home to nearly 60 different species of mammals, including grizzlies, black bears, wolverines, marmots and moose. It can also boast some 280 species of birds including golden eagles, ospreys and white-tailed ptarmigan. Our final day in the Rockies takes us on a shorter, but no less spectacular, trail, Parker Ridge. The trail takes a steady upwards direction (250m of ascent) to get you to the top of the ridge and above the tree line. From the top of the ridge you will get great views of the Saskatchwan Glacier, stretching up the valley that it has carved out over thousands of years. Leaving behind this beautiful region we return to Banff to explore the town and there will also be a chance to pay an optional visit to the Hot Spring. Today's five-and-a-half kilometer hike is expected to take around two hours with 250 metres of ascent. We drive to Calgary after breakfast this morning, where our trip ends. Calgary is one of Canada's most dynamic destinations and depending on your flight time today you will have an opportunity to explore a little of the city on foot from our base at the Ramada Hotel before travelling to the airport. Kananaskis - Helicopter Tour 20 min ride, CAD$198.50, include a 1 hr wilderness stop for CAD$69 + 5% taxes. We recommend you bring walking boots with ankle support- leather or fabric are both fine. Make sure that your boots are worn-in and comfortable before the start of the trip. Also trainers or sandals for relaxing and general wear. Some footwear that you don't mind getting wet is essential for whitewater rafting or canoeing. 10 We suggest that on international flights you either carry your walking boots in your hand luggage or wear them - should your luggage be lost or delayed, your own boots are the one thing that will be irreplaceable. - Bring a sleeping bag (3 season, up to -7C). Sleeping bags can be hired in Canada for $50CAD. Please request them when you book, or no later than 5 weeks prior to travelling. The $50CAD can be paid to your Tour Leader upon arrival. During your two nights at the Lake Louise Alpine Centre you will be sharing a (maximum) four bed dorm. All camping equipment is provided except a sleeping bag. Like many adventures of this type, much of the team spirit and camaraderie is developed through mucking in and helping out with basic camp responsibilities which will include the setting up and taking down of camp and the loading and unloading of the trailer. At some points you may also be asked to help with meal preparation, washing and clearing up. Be prepared for some early starts and some long days - there is an enormous amount to see! Citizens of the UK, New Zealand, Australia and passport holders from several EU countries can apply for an ESTA here - https://esta.cbp.dhs.gov - you must have an electronic passport with a digital chip containing biometric information. If you have visited Libya, Iran, Iraq, Somalia, Sudan, Syria or Yemen since March 2011, or dual national of these countries, you cannot travel with an ESTA. In this case you will need to apply for a visa from the nearest US embassy or consulate. 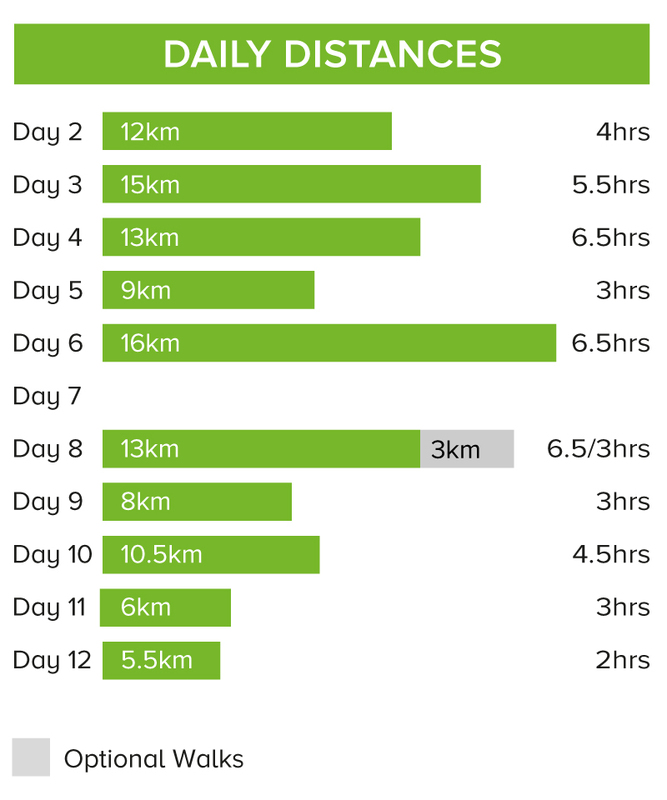 Walks on 10 days for between 2 and 6.5 hours each day. The off-road trails are well-defined with some short steep ascents to viewpoints. Maximum altitude of 2,65m.